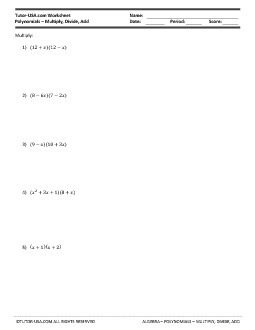 This free algebra worksheet contains problems on polynomials. Students must multiply polynomials, divide polynomials, and add polynomials. Problems may require combination of like terms, factoring, and synthetic division to simplify. To multiple, divide, and add polynomials.